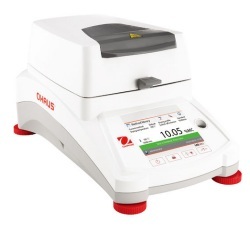 Ohaus MB120 Temperature Guide analyzes a sample and determines the optimal drying temperature. Store up to 100 drying methods for easy recall and up to 1000 total results for statistical analysis. Precisely controlled halogen heating dries samples uniformly, producing repeatable results of 0.01% readability. Four drying profiles & seven shut-off criteria help to perform customized sample tests. Moisture Analysis Made Simple—and Powerful. The MB120 AM delivers functionality and precision that you can rely on, and is easy to operate and clean—you can test more samples in less time! Advanced features such as a temperature guide help to analyze optimum drying temperature, and methods and results storage allows statistical analysis of measurements. Three levels of user management ensure data safety—set up and lock temperature settings and method parameters with administrator access. • Advanced Functionality for Professional Moisture Analysis MB120’s Temperature Guide analyzes a sample and determines the optimal drying temperature. Store up to 100 drying methods for easy recall and up to 1000 total results for statistical analysis. • Precise and Fast Results with Halogen Heating Increases Efficiency in the Lab Precisely controlled halogen heating dries samples uniformly, producing repeatable results of 0.01% readability. Four drying profiles and seven shut-off criteria help to perform customized sample tests. • Easy Tool-Free Cleaning and Intuitive Operation with the Icon-Driven Menu Navigation The MB120 features a removable pan handler and sample chamber for easy cleaning. Operating the MB120 is intuitive—simply follow the guided instructions on the touchscreen display. The robust housing and die-cast base guarantee durability.